CHALLENGER SUPER BIKE RACING น้ำมันเครื่องสังเคราะห์ 100% นวัตกรรม ESTER TECH สำหรับจักรยานยนต์ 4 จังหวะเพื่อการแข่งขันโดยเฉพาะ CHALLENGER SUPER BIKE RACING is ultimate fully synthetic racing motorcycle oil by ESTER TECH innovation designed for 4-stroke racing motorcycle . • Designed for 4-stroke racing motorcycle running at very high speed (RPM) and very high temperature for a long time. 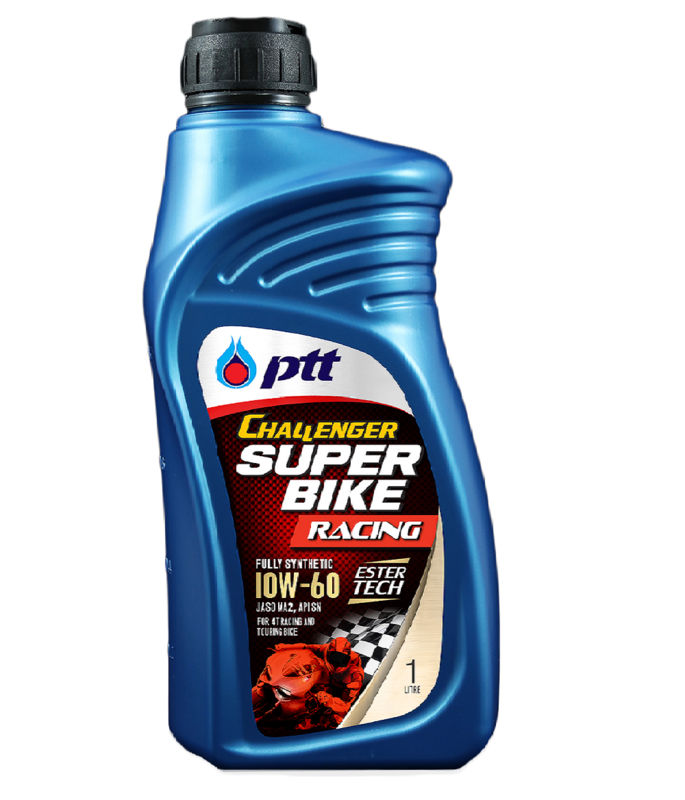 • Suitable for superior performance 4-stroke bikes such as Sport bike, SuperSport, and SuperBike which engine capacity over 600 cc. • Can be used on high performance 4-stroke bike such as Street bike and Sport Touring. ESTER TECH minimizes internal friction of the engine; consequently, maximum torque and power output are unleashed. Extra film strength of lubricant and extremely high thermal stability maximize engine protection over continuously severe conditions. Triple Action Formula improves the clutch locked up performance and smooth gear shifting.